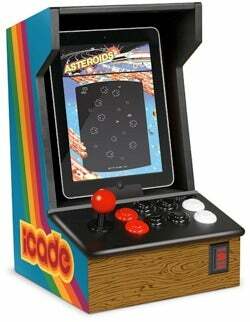 An Atari joystick for your iPad? Now that is kind of cool, and it actually looks like it'll work in a truly connected sense, unlike some of these awkward alternatives where you're basically suctioning something to the iPad's glass surface. Thank Discovery Bay Games, who've partnered with Atari to make it so. The picture speaks for itself—a simple, elegant way to drop an iPad into a dock and slap away at a handful of buttons. The connection's deterministic, so if you're sucking at whatever you're into, you can blame yourself, not the interface. Remember those old tabletop arcade machines? The iCade? That took actual quarters? This reminds me of those, except you can do a lot more than play the same game repeatedly (or wallpaper your office with dozens of micro-arcade boxes). The promotional ad claims it'll work with games like Asteroids, Centipede, and Missile Command. The "games like" part suggests those and a whole bunch more, too. Take Atari's Greatest Hits, where we're talking Battlezone, Black Widow, Crystal Castles, Gravitar, Star Raiders, Pong, Lunar Lander, Super Breakout, Tempest, and more. Discovery Bay announced in early August that it was partnering with Atari to manufacture a gaming accessory for Atari's Greatest Hits for the iPad, so we more or less knew this was coming, but not what it'd look like. The only thing it probably won't do? Work with non-Atari iPad games, which is too bad, as I'm sure there'd be an audience for this sort of thing (maybe something with six or eight buttons?) and pro fighter games like Street Fighter IV. What'll it cost? No word, but the Joystick IT Arcade joystick (the one you have to stick to the iPad's glass surface) costs about $20, and a full-on iCade runs $100, so I'd guess somewhere between $30 and $50.